Blunt/TA Ligase Master Mix is a ready-to-use solution of T4 DNA Ligase, proprietary ligation enhancer, and optimized reaction buffer. This master mix is specifically formulated to improve ligation and transformation of both blunt-end and single-base overhang substrates. Blunt/TA Ligase Master Mix is a ready-to-use solution of T4 DNA Ligase, proprietary ligation enhancer, and optimized reaction buffer. This master mix is specifically formulated to improve ligation and transformation of both blunt-end and single-base overhang substrates. The master mix format simplifies reaction set-up, ensures an optimized ratio of enzyme and buffer components, and yields robust, rapid ligation of all types of DNA ends using a short incubation time at room temperature. No thawing is necessary as it remains liquid during storage at -20°C. * Ligations for subcloning can be carried out in small volumes with low DNA concentrations, allowing users to conserve precious DNA samples and directly transform many strains of chemically competent E. coli without dilution. Learn more about Joining Difficult to Ligase dsDNA Fragments and Efficient Adaptor Ligation for the Preparation of dsDNA Libraries using Blunt/TA Ligase Master Mix. Yields of final ligation product for all reaction conditions using high concentration T4 DNA Ligase (NEB #M0202), the Quick Ligation Kit (NEB #M2200) and Blunt/TA Master Mix (NEB #M0367). Nick, cohesive end and 3´ single-base overhang substrates were incubated for 15 minutes; the 5´ single-base overhang was incubated for 1 hour. * Freezers vary in their actual internal temperature. Our testing demonstrates that the master mix is liquid at -20°C. Freeze-thaw testing at -70°C has confirmed that the performance is unchanged after 20 freeze/thaw cycles. 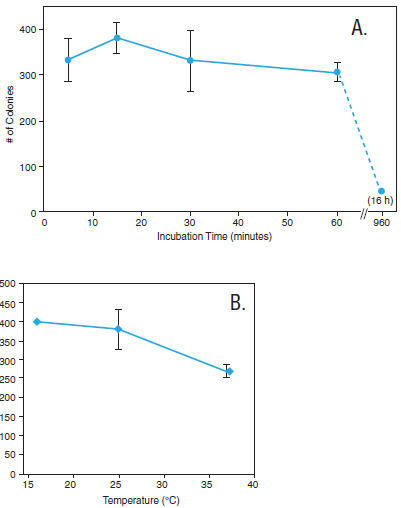 Ligation reactions with single-base overhang vector and insert were set-up using the Blunt/TA Ligase Master Mix and incubated for different times at 25°C (A) or at different temperatures for 15 minutes (B). Two microliters of each reaction were used to transform a 50 μl aliquot of NEB 10-beta Competent E. coli (NEB #C3019). Transformants resulting from triplicate plating 50 μl of a 1:5 dilution of the outgrowth were counted and graphed. The results indicate that the Blunt/TA Ligase Master Mix works well at 25°C, and is complete in 15 minutes. 1X Blunt/TA Ligase Master Mix with DNA substrates in a 10 μl reaction volume incubated at 25°C. A 10 μl reaction contains 1,800 cohesive end units of T4 DNA Ligase. DNA: Purified DNA for ligations can be dissolved in dH2O (Milli-Q® water or equivalent is preferable); TE or other dilute buffers also work well. For optimum ligation, the amount of vector DNA should be 20–100 ng and the insert should be added at a 3-fold molar excess. For ligation volumes greater than 10 μl, increase the volume of Blunt/TA Ligase Master Mix such that it remains 50% of the reaction. Insert:vector ratios between 2 and 6 are optimal for single insertions. Ratios below 2:1 result in lower ligation efficiency. Ratios above 6:1 promote multiple inserts. If you are unsure of your DNA concentrations, perform multiple ligations with varying ratios. Time and Temperature: Most ligations performed using the Blunt/TA Ligase Master Mix reach an end point at 60 minutes or less when performed between 4–37°C. Incubation beyond this time provides no additional benefit. Our recommendation for a 25°C (room temperature) incubation was chosen after evaluation of performance at 4°C, 16°C, 25°C, and 37°C. Most conditions reached at least 50% performance within 15 minutes. Shorter times can also be used. Electroporation: While electroporation can dramatically increase transformation efficiency, Blunt/TA Ligase Master Mix is not directly compatible with transformation by electroporation. It is necessary to reduce the PEG concentration. We recommend purification of the ligated DNA by spin column. My transformations using Blunt/TA Ligase Master Mix reactions produced no colonies. What happened? Can the Blunt/TA Ligase Master Mix be used for the ligation of sticky-end fragments? Can the ligation reaction produced by the Blunt/TA Ligase Master Mix be directly used to transform electrocompetent cells? The recommended volume for a Blunt/TA Ligase Master Mix reaction is 10ul. I like to set-up my ligation reactions in a 20 ul volume. Can I scale-up the reaction? I routinely use more than 5 ul of my ligation reactions to transform 50 ul aliquots of competent cells. When I do this with the Blunt/TA Ligase Master Mix my transformation plates have very few colonies. What do you think is the problem? Can I incubate a Blunt/TA Ligase Master Mix ligation reaction for longer than 15 minutes? Can I incubate a Blunt/TA Ligase Master Mix ligation reaction at a temperature other than 25°C? My Blunt/TA Ligase Master Mix has frozen in my freezer. Is this a problem? The protocol for Blunt/TA Ligase Master Mix indicates the reactionshould not be heat inactivated. How can I inactivate the ligationactivity?